The first significant Islamic kingdom to emerge in Southeast Asia was the sultanate of Melaka, which was founded around 1400 by a local prince who converted to Islam. Other important sultanates in Southeast Asia around the time of Melaka's ascendancy included Aceh in northern Sumatra; Johor on the Malay peninsula; the port cities of Demak and Banten on the north coast of Java; Ternate and Tidore in what is now Maluku: and the kingdom of Mataram [pronounced muh-TAR-uhm], a trading kingdom in central Java. 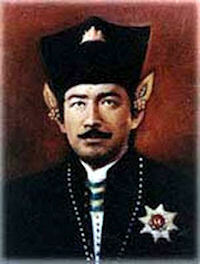 Mataram Sultanate was founded by Ki Ageng in 1586 AD. The Sultans of the Central Javanese Mataram kingdom identified themselves as descendants of the heroes in the Mahabharata as they were represented in the wayang kulit. During this period several genealogies were written that traced the lineage of these Javanese rulers all the way back to wayang purwa epics. By the end of the 16th century, Islam, through conversion firstly among the elite of Java, had surpassed Hinduism and Buddhism as the dominant religion in Java. By the early seventeenth century, the most powerful state in Central Java was Mataram, whose rulers cultivated friendly relations with the Pasisir states, especially Gresik, and tolerated the establishment of Islamic schools and communities in the countryside. Tolerance may have been motivated by the rulers' desire to use the schools to control village populations. Muslim groups in the interior were often mutually antagonistic, however, and sometimes experienced official persecution. During this era, the Islamic kingdoms of Demak, Cirebon, and Banten were ascendant. The Mataram Sultanate became the dominant power of central and eastern Java at the end of the 16th century. The principalities of Surabaya and Cirebon were eventually subjugated such that only Mataram and Banten were left to face the Dutch in the 17th century. Twenty kilometers to the south of the volcano Merapi lies the the kraton ‘‘residence of the king’’ of Yogyakarta, the origins of which date to the breaking up of the Sultanate of Mataram by the Dutch in 1755, and where the last ruling sultan (viz., who holds civil authority over a province) in Indonesia still sits to this day. The kraton of the sultanate is located on a direct line between Merapi volcano and the Java Sea to the south, and the union of the spirits of mountain and sea is thought to be integral to the spiritual power of the court. In AD 1613 the eldest son of the prince succeeded his father, taking the name of Adi Mataram. He and his son alone took the Arabic title of Sultan, their predecessors contenting themselves with the humbler appellation of Panambahan, and their successors taking the spiritual distinction of Susunan. In Javanese history he is called Sultan Agung, or the Great Sultan, a title which he undoubtedly deserved, for he was not only the greatest conqueror, but the best prince of whom any mention is made in Javanese story. In a reign of thirty-three years, he conquered the whole of the eastern districts, including the principality of Blambangan, at the extreme east, Cheribon, and thewhole of the Sunda countries, except Jacatra and Bantam. Javanese notions of kingship were never as static as Western discourse has frequently asserted. Even on the eve of Dutch colonialism, the relatively new kingdom of Mataram was undergoing significant changes in its ruling philosophy. While much continuity from earlier kingdoms was extant in Mataram, concepts of hierarchy and duty were continuing to develope, as was the notion of an aristocratic class known as the priyayi. The serat (“mystical songs”) and the babad (“kingly chronicles”) written in the 17th, 18th and 19th c. Mataram kraton by the court-poets (pujangga) for the blood aristocracy and the priyayi service nobility spells out an elaborate theory of the State (negara) as an autonomous (soverein and timeless) entity peopled by highly-qualified government specialists (punggawa). Starting under the reign of Sultan Agung (r. 1613-1646), there took place in the Mataram kingdom of East and Central Java, a process of both administrative and ideological transformation, linked to the consolidation of the priyayi status group. The priyayi were raised to an aristocratic condition by the king, but they could not beget their status and administrative positions to their sons : they were to lose their aristocratic titles after two or three generations. They therefore had no choice, to assert a moral identity of their own that would help them protecting their families’ rank, but to devise a theory of the State that would make the holding of high bureaucratic positions a question not only of one’s genealogical fame, but also of one’s acquired skills and virtues. In 1617 the Sultan of Mataram Abul Mafakhir tried to expel Dutch by laying siege to the Dutch trading camp. The Dutch United East India Company (Verenigde Oost-Indische Compagnie - VOC) needed large supplies of rice to feed its labor in the spice islands, and these supplies could not be derived from local sources. In the mid-1630s, for example, the Arakanese king observed that the Dutch were desperate for Arakanese rice because of the Dutch armed conflicts with Makassar, Mataram, and Bantam. The English faced this problem as well, particularly from the Mataramese economic blockade in western Java. Thus, the Dutch established a permanent factory at Mrauk-U in the early 1620s. Starting with the tactical mistakes of Sultan Agung’s successor Amengkurat 1st (r. 1646-1677), and reaching a turning-point with the 1755 Giyanti Treaty, the negara of Mataram lost most of its political autonomy to the Dutch United East India Company (VOC) – that meddled into Javanese succession affairs like a bull in a China shop. After the bloody Java War (1825-1830), the priyayi became part of the new Dutch colonial apparatus. The city of Yogyakarta, or simply Yogya, came into being in 1755, after the division of the Sultanate of Mataram into the Sultanates of Yogyakarta and Surakarta (Solo). Gamelan, classical and contemporary Javanese dances, the wayang kulit leather puppet theater and other expressions of traditional art will keep the visitor spellbound. Local craftsmen excel in the arts of batiks, silver and leather work. The Sultan's palace is the hub of Yogya's traditional life and despite the advance of modernity, it still emanates the spirit of refinement which has been the hallmark of Yogya's art for centuries.